The human hand is an anatomical wonder. Each hand and wrist has 27 little bones. Think about all the different movements your wrists, hands, and fingers can make, and you can probably understand why they need so many bones: Many bones mean more movement. If they had just a few big bones, your hands wouldn’t move well at all and you wouldn’t accomplish much in a typical day. Eight small bones provide strength and a little flexibility to your wrist. They’re called carpal bones, so sometimes the wrist is referred to as the carpus. Most of your wrist movement is between the carpal bones and the radius bone of the forearm, but some gliding action occurs between carpal bones. Five metacarpal bones make up the structure of the palm of your hand, which is also known as the metacarpus. They’re easier to remember than the carpals; they’re simply named the first through fifth metacarpals. 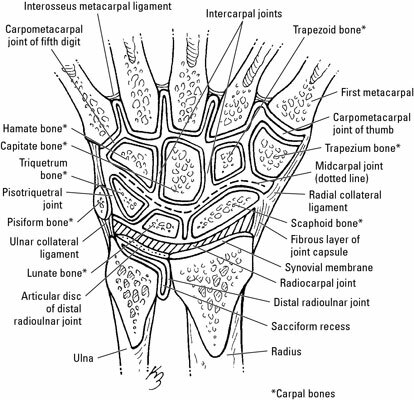 The first metacarpal is on the lateral, or thumb side, of your hand. The fifth metacarpal is on the medial side, just under your pinkie finger. Each metacarpal has a base, which articulates with the carpals, and a head, which articulates with the finger bones (clinically known as the phalanges) to form the knuckles. The finger and thumb bones are called the phalanges. Each thumb has two phalanges: a proximal phalanx articulates with the first metacarpal, and a distal phalanx forms the tip of the thumb. The rest of the fingers have three phalanges each: proximal, middle, and distal phalanges. The phalanges are fairly simple bones. Each one has a base on its proximal end (the end closer to the arm), a shaft in the middle, and a head on the distal end (toward the fingertips).